Many Gambians are already sensitised to the topic of climate change, and some develop their own approaches on how to improve their situation in the future. Gambians understand that their livelihoods depend on highly ambitious global mitigation actions, and therefore support their country’s engagement in the international process under the United Nations Framework Convention on Climate Change, including the formulation of the country´s contribution to a global climate agreement – Intended Nationally Determined Contribution (INDC). As part of the Gambia’s INDC formulation process, the government carried out eight regional workshops in all of the country’s major regions in March this year. These workshops were designed for the dual purpose of deepening knowledge about climate change and getting input from a diverse and wide range of stakeholders for the INDC preparation process. The workshops presented information on climate variability and climate change impacts in the Gambia, with a focus on vital sectors of the Gambian economy, namely the agriculture, forestry, energy and waste sectors. Second, the workshops informed local stakeholders on the role of the Gambian government in the UNFCCC process. These subnational consultations turned out to be of high importance to the Gambia’s INDC preparation process: citizens need to be given the opportunity to be included in an important decision-making process which will impact their livelihoods, and consultations are needed to ensure buy-in from citizens. The local consultations are key to create sustained links between climate actions and local development. Countries like the Gambia are amongst those that have contributed little to the current climate change situation, but will be amongst those most affected by its effects. By offering public participation, all relevant stakeholders are made aware of the issue and empowered to actively shape their own future. Thus, the result is not only an optimised INDC with good emission reduction pathways, but also support for the necessary local development. A key result from the workshops is that locals are aware of and very interested in climate change and mitigation opportunities, as well as adaptation opportunities. Rural communities, which are highly dependent on agriculture and forestry, proposed the most numerous mitigation options. 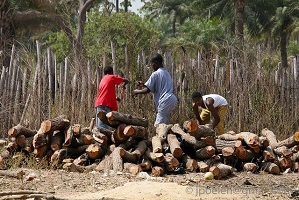 These activities were tailored for local circumstances in these sectors; such as, for example, the replacement of firewood to reduce pressure on the forests. Most of these proposals are covered in the INDC and some are also covered by parallel national policy initiatives. All in all, it’s clear that Gambians are keen to be involved, seeing the INDC formulation process as an opportunity to improve their livelihoods – both directly through measures with double-benefits in local development and mitigation, and in the long run, by reducing climate change impacts. Occasionally, CDKN invites guest bloggers from around the world to contribute their views on climate compatible development to cdkn.org The views expressed are not necessarily those of CDKN or the members of the CDKN Alliance.